One way we can try to say something about is to ask which value of maximizes this expression. Calculus teachers, rejoice! Since the binomial coefficient in the front is constant with respect to , we can drop it, and simply try to maximize . Many students will, naturally, dive right in and differentiate this with product and chain rules. Students who have seen the tricks before (or are especially perceptive) will realize that the expression is maximized when its log is maximized, since log is monotonically increasing. So we aim to maximize , for . This derivative is easy to calculate, and has a single 0, at , which can be verified to be a local/absolute maximum. So, that’s nice. And a lot of work to determine what everybody probably already knows. If you’ve got a biased coin that you flip 100 times, and obtain 75 heads and 25 tails, your guess probably should be that the sides are weighted 3 to 1 (i.e., that ). Knowing that it’s all random to an extent, though, we aren’t certain of our answer. What we’re really like to know is the probability that is 0.75, versus, say, 0.72 (which could also certainly have generated the observed data). 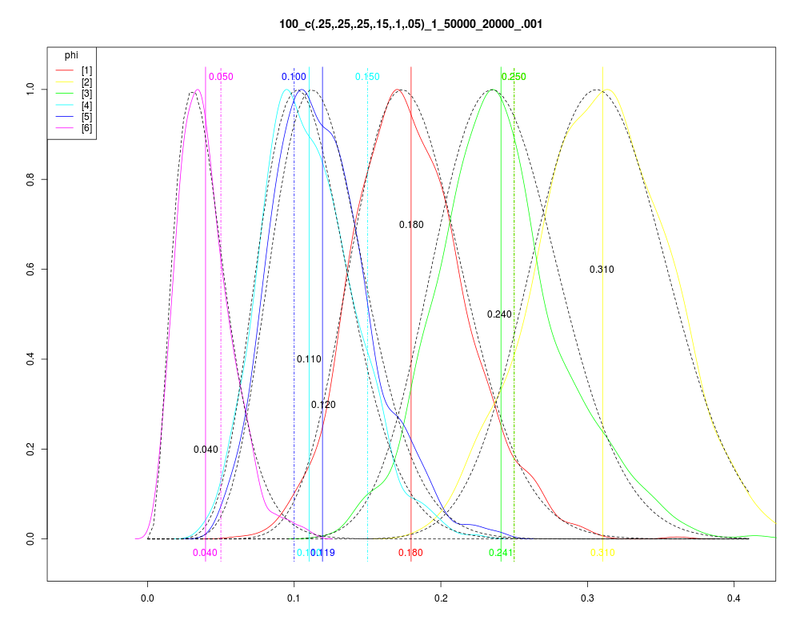 The mode (not the mean) for this distribution is exactly what we calculated before, 75/100. Now, something somewhat interesting just happened, without our trying much. We didn’t really have many good guesses for what the distribution of , so we just picked the uniform distribution. 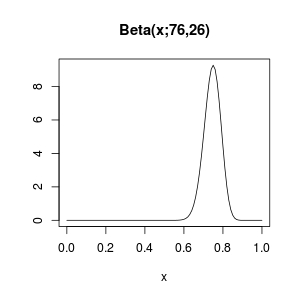 It turns out that the uniform distribution is a special case of the Beta distribution, namely . 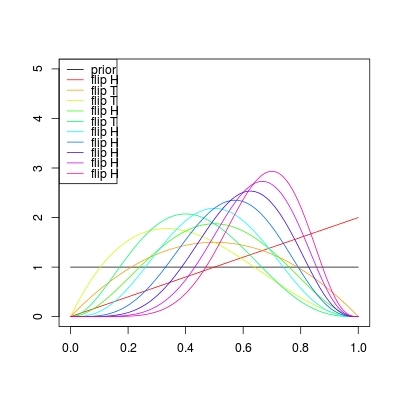 What’s noteworthy, if you’re into that sort of thing, is that we started with a “prior” guess for the distribution of of a certain form, , and then we updated our beliefs about based on the data (the number of heads and tails flipped), and ended up with a “posterior” distribution for of the same “form”, . This is sort of a happy accident, if you’re required to do this sort of Bayesian analysis by hand, apparently. It makes it easy to update again, if we flip the coin some more times. Suppose we flip several more times and see heads and tails. Well, we’d use our latest beliefs about , namely that it came from , and then update that information as before. All that happened before was that we added the number of heads to the first parameter of the Beta distribution, and the number of tails to the second parameter, so we’d do that again, obtaining ). In fact, there’s no reason we’d have to cluster our flips into groups – with each flip we could update our Beta distribution parameters by simply adding 1 to the first parameter for a head, and to the second parameter for a tail. Oh, and the more formal description for what’s going on here, besides “happy accident”, is that the Beta distribution is the conjugate prior for the Binomial distribution. This also suggests that we didn’t have to start with the uniform distribution, , to have this happy accident occur. We could start with any , and then after observing heads and tails, we’d update our beliefs and say that came from . So maybe there’s a better choice for those initial parameters, and ? In a very real sense, which we’ve already seen with this updating procedure, these parameters are our prior belief about the coin. If we’ve never flipped the coin at all, we’d sorta want to say that and are 0, but the parameters of the Beta distribution are required to be positive. So we’d say we don’t really know, and choose a “weekly informative” prior, say 0.001 for both and . The point of choosing such a small prior is that it lets the data have a strong governance on the shape of the distribution we get once we update our beliefs having seen some data. This is because is very similar to if and are small (relative to an ). If you’d like to play around with actually running some code (and who doesn’t? ), below is some R code I threw together. It simulates a sequence of flips of a weighted coin, and plots the progression of updates to our belief about as we run through the flips. is the analytic extension of to the complex plane (our binomial coefficients from before seem to have been wrapped up into the normalizing constant, ). While I’m sure there’s no shortage of places you could read more about either the Beta or Gamma functions, I must say that I was enthralled with Artin’s book on the Gamma function. Delightful. Ok, moving on. Choose a distribution of weights for sides of our die, by picking from . Roll the die, recording the side, , a sample from the categorical distribution . What happens if I have more rolls ( )? Fewer? If I pick a bad prior (e.g., a with large values), what happens to the output? How can it be compensated for? To what extent? Basically there’s a bunch of knobs to twiddle, and all sorts of fun can be had. But let’s see if we can actually get closer to LDA, shall we? Roll the T-die to decide which of the W-dice to roll. Roll the appropriate W-die, and record the result. I took the priors out, above; mostly I still feel like they’re a gap in my understanding. But whatever, good enough. It’s natural at this point to wonder how you’d take the word order into account anyway; I haven’t looked into it much, but there’s at least one paper [pdf] on the subject. One might also wonder how to to determine the number of topics if that constant ( ) isn’t given to you with the word count tabulations. Again, this has been addressed [pdf], though I haven’t dug into it a whole lot. And let’s not forget, let’s not forget, that I still have basically no idea how or why Gibbs sampling (and/or other MCMC methods – Metropolis-Hastings, I’m looking at you) works. Finally, I was honestly a little surprised to find that the OpenBUGS model above, and the R script I coded up to use it, took something like 8 hours on sample data I generated to throw at it (maybe 1000 words, 3 documents, 2 topics, or so). I then looked at the lda package in R, manipulated my sample data so I could feed it to that, and got answers out in about a second. Clearly there’s something else going on there. My investigations so far have me thinking the difference is probably described in this paper, but it, along with everything else I’ve just mentioned, is still in the “todo” pile. So, more questions than answers, though I feel like I answered a few questions for myself in all of this. It’s probably some sort of life lesson that learning one thing just opens up the doors for not knowing a whole bunch more, or something. Hopefully I’ll keep chipping away on these or related topics (or, at least, something interesting). And maybe I’ll just find the energy to write about it, to help point out all the things I don’t understand. Anyway, thanks for coming with me on this. Sorry it took me so long, and left so many questions. In addition to the links above, I found this paper helpful/interesting. Update 2015071: Corrected variable of integration in formula for $\Gamma(z)$, thanks to comment by Joel Nothman. I’ve recently been doing some work in R, and using the foreach package for some easy parallelization. I’d like to be able to spit out logging messages throughout my code, but the print lines always disappear when they are in the code executed by the %dopar% operator. So I’ve been working on trying to come up with a nice way to still capture/print those logging messages without having to change much of my existing code. I think my ultimate goal would be to write another binary operator which I can use as a drop-in replacement for %dopar%, which uses dopar under the covers, and which gets my print lines to the console. I haven’t quite gotten to that point yet, but I might be close-ish, and, either way, what I’ve got seems like it could either be useful for others, or something others could suggest how to fix. That final line return a vector with 10 elements, the squares of the integers 1 through 10, as expected. However, the thing I’m trying to overcome is that none of the expected print lines show up on the console. I admit that this may be somewhat of a misguided quest. Changing the %dopar% to simply %do%, all of the print lines show up. And maybe I shouldn’t be doing objects the way I have them. I like to think an argument could be made for still trying to make my logging work within %dopar%. I’m not going to try to make an argument though. If you think it’s a useless mission, go find something else to read – there’s plenty of other interesting things online. Or stick around anyway, perhaps you’ll find something interesting here, or be able to help understand whatever it is I’m missing to make it work the way I want. And I get all my print lines, and the same return value from the %dopar% call (the vector of the first ten squares) as before. Admittedly, I’m a little surprised that this seems to work, now that I think about it. The shared logger is buffering messages for several threads, which seems sort of troublesome. I guess they’re kept separate enough by the threads, or I’ve just gotten lucky the twice I’ve run the code above. If I only had one or two foreach calls in my code, I’d probably just fix them as above and be content enough (if the last thread-safety concerns calmed down). However, there’s clearly room for some automation here. What has to happen? The expression evaluated by %dopar% needs to return whatever it did before, as well as the accumulated messages during the execution. The combine function needs to return what it did before, and print out the logging messages. unable to find variable ".logger"
Rats. I haven’t yet found the right combination of quote, eval, substitute, … to make this work, and I’ve tried several. I’ve been reading about environments and frames and lexical scoping and closures, and still haven’t gotten it right. If I put the definition of %jdp% in the do.stuff function, it actually works. But that’s ugly. Nothing else I’ve come up with works and involves as few changes as wrapping the two arguments to the %dopar% operator, as in the jazzed.guy.using.logger above. So, if anybody’s got any suggestions, just let me know. In the mean time, I’ll either poke around in the %dopar% source for inspiration, or move on to other things. So you may have noticed my lack of math posts recently. Things change, you know. I might still have a few left in me, at some point. Either way, this blog may start having more programming. I’m putting this one here instead of at Euler’s Circus, only because it’s not a Project Euler problem. Getting on toward time to consolidate my blogging… maybe when I’m done with grad school (soon!). Anyway, right. So here’s a programming post. I’m not sure how I came across the Programming Praxis blog, but one of their recent posts caught my eye: find the longest palindrome in a string. Given a string, what is the longest palindrome contained in that string? I thought about it (actually thought about it, instead of just thinking I would like to think about it) for a few minutes this evening, and came up with a little something that pleased me. Python‘ll do that. There may be a built-in python-y way to do this, but I like this anyway. I guess I’m just a sucker for map. And list comprehension. Or, perhaps more appropriately, “A” Steinhaus conjecture, he/she (I’m guessing Hugo, so he. Perhaps I’ll look into it) seems to have made a couple. This conjecture (theorem) also goes by the name “The Three Gap Theorem”, or “The Three Distance Theorem”. Which is all a little annoying, I think. It makes looking for references 3 times as hard, I reckon. 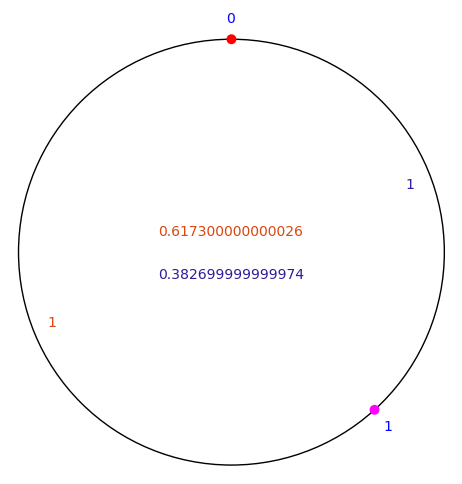 But it’s a pretty cool result, and I’m glad Dave Richeson brought it to my attention via his blog post on Three cool facts about rotations of the circle. Theorem: Suppose that is irrational. Let be a positive integer bigger than 1, and consider the points for . These points partition the interval into subintervals. If the distances of these subintervals are calculated, there will be either 2 or 3 distinct distances. 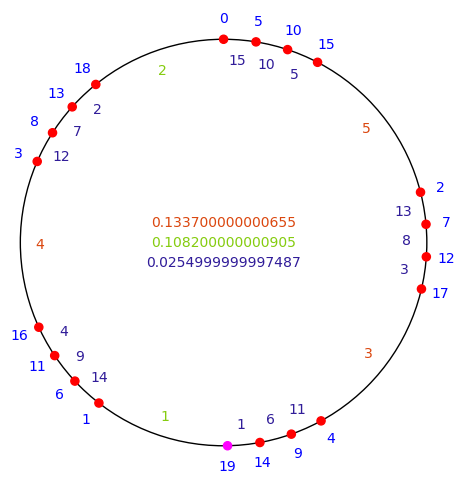 The circle comes in by thinking of the interval as a circle with circumference 1. To help visualize it, Dr. Richeson made a pretty sweet GeoGebra applet. I think this is a pretty initially surprising theorem. My initial shock has worn off just slightly, now that I’ve played with pictures and dug through a proof, but it’s still a wonderful result. I mean, irrational values are supposed to do weird things, right? Their multiples should bounce all over the place in the unit interval. And yet, they partition the circle into just 2 or 3 differently-sized gaps? Crazy talk. Also, the theorem as stated above isn’t as strong as it could be… you can say a bit more about the distances. I think I’ll talk more about it in another post. I started reading about this theorem, after Dr. Richeson’s post, in the paper by Tony van Ravenstein. As I was reading the proof I got hung up on some details, and found that consulting the paper by Micaela Mayero got me over those difficulties. The paper by Mayero is essentially a formal proof written for the Coq formal proof system, so it sort of makes sense that details will be pretty fully explained in it. Either way though, it’s really not a long or particularly difficult proof (you mostly play with some inequalities). I may return, in a future post, to talking about the proof, and I’ll certainly come back and tell you as I read more about further consequences and generalizations, and whatever else I find in some other papers I’m planning on looking at. But for now, let me mention a result in van Ravenstein’s paper. He proves that in going from the picture with points to the picture of points, the -th point will break up the oldest of the intervals with the largest length. The “age” of an interval is pretty intuitive. If a particular interval, say between multiples and comes in when there are points, and those two points are still neighbors when there are points, then the age of that interval, at stage , is (plus 1, if you want, it doesn’t matter). To help picture what’s going on, I made an interactive Sage notebook. If you have an account on sagenb.org, or have Sage installed on your own computer and want to just copy my code over, you can look at my code and play with the notebook. I had hoped that publishing my notebook there would let you play with the interactive bits without you needing an account, but no dice. Sorry. To give some sense of my notebook, and the theorem, I’ve got some pictures for you. 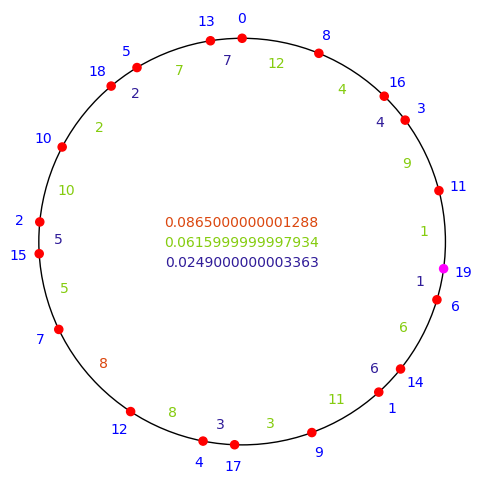 Along the outside of the circle, at each dot, I list which multiple it is. The “newest” dot is magenta, instead of red (probably not great color choices… mess with my code and make your own :)). 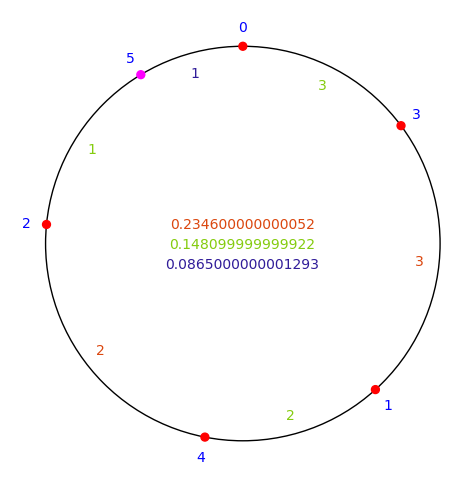 In the center of the circle I list the lengths of the intervals, in decreasing order. Along each interval, I also write the age of that interval, and color-code the text to the list of distances. I’ve decided to always have the largest length be red-orangeish, the smallest length blue-ish, and the middle length (if there is one) green-ish. In the picture above, the interval on the left is clearly the oldest of the longest length intervals, so the theorem is that when we add another point, this interval will get broken up by that point. Which is clearly true in this case. I like how the points seem to develop in clusters (also evidenced by Dr. Richeson’s app). Postscript: I want to make a few shout-outs. I thought putting them at the end of this post might interrupt any sort of flow of the article (if there is any) a little less. I was inspired to make an interactive sage notebook by Mike Croucher’s recent posts at Walking Randomly.
""" Make the picture for alphaval and all (up to maxN) numbers of points """
# first, what are the 2 or 3 distances? # now that we know the 2-3 distances, we can tell which points have which dist. Theorem: There is a constant, , such that for almost all in , if the continued fraction representation of is , then as . I’d like to try to give some very brief background on this theorem, along with the “few minutes introduction of some easy definitions and results”. I should mention, first, that I take Khinchin’s book “Continued Fractions” as my primary reference. Hardy and Wright also have some chapters on continued fractions. And, of course, there’s Wikipedia. Since I picked irrational, this process keeps going – you keep getting (all positive integers) and (all in ). And then instead of writing huge nested fractions, you trim it down to . That initial zero is just becuase I started with , you could instead let , if you started with an outside . I’ll continue assuming my values are in , so I’ll frequently just write , dropping the initial zero. This process gives us, for every , a sequence of values . Restated, we have functions (and as well) from to positive integers. To start getting at Khinchin’s constant, you think about combinations of , for collections of s and s. That is, given and , all positive integers, what does the set of all such that for look like? As an example, is , the third stair from the right. Now, on to . What does look like? Well, in finding the continued fraction for , we find first , and if then , or . So we find that for any , all values between and have . That is, in each of the “stairs” from the discussion of , the graph of has another staircase, this time ascending as you move from left to right. For example, comprises, in the ascending staircases in each interval , the second stair from the left. It is an infinite collection of intervals. If you also ask about those where is some constant, you pick out a single subinterval. So we’ve got at least a little idea about how these functions work. Given and as above, the set of all with will be an infinite collection of subintervals of . Next you could ask, what is the measure (sum of lengths of intervals) of this set? I’ll mostly talk about the case when , , and . I’ll denote the set of appropriate by , and the measure of that set by . This, by itself, seems pretty interesting. I find it a hard limit to interpret. After all, and have nothing to do with eachother, so the measure that we are calculating is of a completely different set with each . If, instead, we were taking measures of a sequence of nested subsets, or something, I feel like I could get a better handle on this theorem. But we’re not. If anybody has a nice interpretation of this limit, I’d love to hear it. Khinchin’s constant is obtained from the case when , simply messing with the equality using log and exponent rules. Pretty awesome. Pick a positive integer. Pick any you want (pick several!). Find all of the elements in the continued fraction for , and the percentage that are your chosen integer (it will be a positive percentage!). You’ll get the same percentage for all of the you pick. Unless, of course, you have terrible luck (or are malicious) in picking . When you’re done with all of that, you might check, as a fun little algebra exercise, that the sum of all of the expected densities, over all choices of , is 1, as it should be. There are a few other interesting results like this. For some reason I have a harder time remembering them, and so they didn’t get to be my favorite theorem. But they’re just as cool, really. This constant gets called the Lévy-Khinchin constant on Wikipedia. So anyway, what’s your favorite theorem? I think I’m about ready to tie together Farey sequences and the Riemann zeta function (specifically, the Riemann hypothesis). I know there were lots of gaps along the way, and lots more to explore from here, so that all gets to be the dénouement, if/when I get to it. Now if (we could say something more like ) for some positive real value , then this most recent integral will converge for . Which means that would have no zeroes in the half-plane . Since there are zeroes on the critical line, where , we know that no value of less than 1/2 will work. But if you can show that for every positive , then you’ll have proven the Riemann hypothesis (and earned yourself a cool million). Ok, so now we just have to relate the Farey sequences to this somehow. It’s been a while, so perhaps we should recall some basics about the Farey sequences. The -th Farey sequence, denoted consists of the reduced fractions in with , ordered as usual. For today, let’s actually remove 0 from the sequences. Thinking about how many terms are in , we quickly determine that there are , where is the number of positive integers less than that are relatively prime to (with ). Let me call this sum , so that has terms. To keep my notation under control, fix an . Then for , let be the -th term in the Farey sequence . The terms in are not equally spaced in , so let us also consider the sequence of equidistant points in . These will be the values . We’re interested in how far the Farey sequence is from this equidistant sequence, so let’s set . By the way, I’m being a bit loose with my values of these stepwise things when they actually make their steps. Apparently the convention is to define the value at the change to be the midpoint of the values on either side. I feel like it’s a technicality I’m not hugely interested in right now. If is for every , then the Riemann hypothesis is true. Hurray! The result that encouraged me to wander down this path! Yesterday I mentioned Möbius inversion, and I decided that it was worth looking at a little bit more. First of all, it’s pretty fun. Secondly, it’ll give us a useful identity concerning . Let’s begin today with a proof of this statement. Pf: Suppose is as stated, and consider . By assumption on , this is which I’ll write as . Now in this sum, what is the coefficient of ? Well, it is . We saw yesterday that this sum is 0 unless , i.e., unless . So , as claimed. That’s pretty fun, I think. There’s another way to go about these things, and it is by way of what are called Dirichlet series (according to Wikipedia, Dirichlet had many names). Suppose is a function defined on the positive integers (such a function seems to sometimes get called an arithmetic function). I’ll say that the Dirichlet series for is the series . I’ve written it this way, so that I have a function defined whenever the series converges, but I’ll pretty much ignore convergence aspects in what follows. By the way, I’ve called the product series because it also gets called the convolution of and . The convolution of and is denoted , and is simply the function . Now you’ve got an operation, , on arithmetic functions, and you can start asking what properties it has. It turns out that gives the set of arithmetic functions (well, those functions that aren’t 0 on the input 1) the structure of a commutative group. The identity is the function with and if (corresponding to the identity Dirichlet series, the constant function 1). It’s sort of a fun little induction problem to find a formula for the inverse of a given arithmetic series. We won’t need the formula exactly, so perhaps I’ll leave it for you. Let , so that the associated Dirichlet series is . How’s that for an identity? Now, like we’ve been doing, let’s ask, “what is the coefficient of when the product is all written out?” Well, the only way to get is the term corresponding to the prime factorization of . If , then the coefficient is . But is “multiplicative,” meaning that if and are relatively prime then . So the coefficient of is just . This proves the identity. That’s the identity we’ll use in the next post or two to finally tie together Farey sequences and the zeta function, believe it or not. So I’ll basically stop here. But I do want to mention that you can do some of the things we’ve done above in slightly more general contexts, and I remember really enjoying reading about them. Namely, you can work in other posets. In what we’ve been doing above, there has, somewhere in the background, been the poset of positive integers ordered by iff . Probably a good place to start reading about the generalization is Wikipedia, as usual. If I find, sometime, the paper I read where I first saw these things, I’ll update this post. The goal today is to use this formula for to find a formula for primes. In particular, we will find a formula for , which is the number of primes no larger than . These two functions are related, as follows: recall that is a step function which jumps by at every prime power . Pick an . How many jumps of size 1 does make before getting to ? Well, it jumps by 1 at the primes, so it makes jumps of size 1. How many jumps of size 1/2? These are jumps at prime squares, . This inequality is the same as , so we make jumps of size 1/2. Similarly, we’ll make jumps of size to calculate . Eventually (for some large enough ) will be less than 2, and so , and we can stop looking for jumps. I’ve written it as an infinite sum, but eventually (like I said) those values will be 0, so we’ve really got a finite sum. Now wait, our goal was a formula for , in terms of , and I’ve got a formula the other way, in terms of . This is the part I got stuck on yesterday. Edwards’ book says (or perhaps doesn’t, causing my problems) that basically you do Möbius inversion to the sum above, and obtain a formula for in terms of . He says slightly more than that, but I wasn’t able to piece it together as easily as he seemed to indicate it should work. But anyway, what’s this Möbius inversion thing? I’ll take a pretty low-level account, leaving lots of room for things to be jazzed up (which I may return to and do sometime soonish). So, for example, is -1 at any prime, , and . If then , and conversely. Well, I tried to figure out how my expression for , in terms of s was such an of . I don’t see it, as stated. Perhaps somebody can point me in the right direction in the comments. (By the way, this is (almost verbatim) the proof in Hardy and Wright’s “An Introduction to the Theory of Numbers”, and I’ll count that as one of my references for anything I say about ). I guess the point of Riemann’s paper was that the terrible integral formula he obtained for could then be used in this expression for , to give an exact analytic expression (that is, one only an analyst would find pretty) for . Pretty wild, in my mind. where . Today, we’ll analyze some more, and re-write the formula above. Notice that if you plug in the formula on the left-hand side, you obtain the right-hand side. where the product is indexed over the roots, , of (so ). If you’ve heard anything about the Riemann hypothesis, you know that the roots (the “non-trivial” ones, I didn’t talk about the trivial ones) of are a big deal. Our second formula for shows that they are (basically) the same as the roots of , and so they are the that the sum above is indexed over. The symmetric equation from earlier has a little something to say about the zeroes, and it has been shown that all of the zeroes have real part bigger than 0 and less than 1 (this is called the “critical strip”). The hypothesis (whose truth won’t affect what we’re saying below) is that all of the zeroes have real part 1/2 (this is the “critical line”). Apparently Riemann didn’t need this hypothesis for the things in his paper that introduced it, so I don’t really have much more to say about it right now. Although, honestly, I still don’t see what all the fuss is about 🙂 The formulas we’ll get below and tomorrow work even if the roots aren’t on the critical line (unless I’m missing something important. If I am, please comment). Anyway, back to the topic at hand. Let me try to convince you that it isn’t horribly unreasonable to think about writing a function as a product over its roots, as I’ve done above. For the sake of example, let (or pick your own favorite polynomial). The usual way this would get factored, in all the classes I’ve ever taken or taught, is (up to permutation) , showing that the roots are . However, if you factor a 4 out of the term, and -1 and -2 out of the other terms, you can also write . You still see all the zeroes when you write the polynomial this way. You can also see that the coefficient in the front is . So we’ve written , which is the same goal as what we’re doing with above. Incidentally, the idea of writing a function this way was also used by Euler to establish (I’ve mentioned this briefly elsewhere). where, as before . Now plug in the 5 terms we’ve got above for , and you get a formula for . What happens to the terms? Can you actually work out any of the integrals? It’s clear that the term drops out, because you divide by and then take the derivative of a constant and just get 0. The term with ends up just giving you , which is . (as if that were helpful). This function is, rather famously, related to approximating the number of primes less than a given bound. In fact, tomorrow I plan on having more to say about this. But back to the terms in our integral for .